In this Philippine name, the middle name or maternal family name is Castelo and the surname or paternal family name is Barretto. Claudine Margaret Castelo Barretto (born July 20, 1979) is a Filipino film actress, television actress, entrepreneur and product endorser. Barretto first starred in ABS-CBN's youth-oriented variety show, Ang TV in 1992. She then was cast in Home Along Da Riles that same year, the film adaptation of the series became her debut in film in 1993. Claudine landed her first television drama lead role in 1997's Mula sa Puso which ran for three years and established her as a household name in Philippine Entertainment. ABS-CBN is a Filipino commercial broadcast television network that is the flagship property of ABS-CBN Corporation, a company under the Lopez Group. The network is headquartered at the ABS-CBN Broadcasting Center in Quezon City, with additional offices and production facilities in 25 major cities including Baguio, Naga, Bacolod, Iloilo, Cebu, and Davao. ABS-CBN is formally referred to as "The Kapamilya Network"; kapamilya is a Filipino term which means a member of a family. This was originally introduced in 1999 and was officially introduced in 2003 during the celebration of its 50th anniversary. It is the largest television network in the country in terms of revenues, assets, and international coverage. Ang TV is a youth-oriented comedy variety show in the Philippines. The show's format was inspired by its predecessor Kaluskos Musmos, and its foreign counterpart The Mickey Mouse Club. Prior to 1992, Raymund Pilada, a Filipino director, enlisted a group of kids and pre-teens to create the first ever youth-oriented variety show in the Philippines. Home Along Da Riles is a Philippine situational comedy series that aired on the Philippine television network ABS-CBN from 1992 to 2003. The title started out as a play on the feature film Home Alone and with the main character's first name taken as a direct copy from the film's protagonist. She is known for her performances dramas such as Mula sa Puso (1997-1999), Saan Ka Man Naroroon (1999-2001), Sa Dulo Ng Walang Hanggan (2001-2003), Marina (2004), and Iisa Pa Lamang (2006). Saan Ka Man Naroroon is a Philippine television series on ABS-CBN that ran from April 12, 1999 to March 23, 2001 replacing the 2-year run Mula sa Puso. It stars Claudine Barretto in the three contrasting roles of Rosario, Rosenda and Rosemarie or Rosita, triplets who were separated at birth. The series was popular throughout its run and also led to the rise of Barretto's acting career. Sa Dulo ng Walang Hanggan is a Philippine primetime teleserye aired from March 26, 2001 to February 28, 2003 by ABS-CBN replacing Saan Ka Man Naroroon. This is Claudine first show without her loveteam partner Rico Yan, and Carlos first loveteam with Claudine. Iisa Pa Lamang is a 2008 Philippine melodrama romantic suspense television series directed by Ruel S. Bayani and Manny Q. Palo. The series stars an ensemble cast consisting of Claudine Barretto, Angelica Panganiban, Diether Ocampo, Gabby Concepcion, Cherry Pie Picache, Susan Roces, Laurice Guillen, Joel Torre, Melissa Ricks, and Matt Evans. The series premiered on ABS-CBN's Primetime Bida nighttime block replacing Lobo on its timeslot from July 14 to November 7, 2008. Claudine is also known for taking part in films such as Dahil Mahal na Mahal Kita (1998), Anak (2000), Got 2 Believe (2002), Kailangan Kita (2002), Milan (2004), Nasaan Ka Man (2005), Sukob (2006), and Etiquette for Mistresses (2015). Dahil Mahal na Mahal Kita is a 1998 Filipino drama romance film produced by Star Cinema, starring Claudine Barretto, Diether Ocampo and Rico Yan. The movie was directed by Wenn V. Deramas and received a grade of "A" by the Cinema Evaluation Board. The Child (Anak) is a 2000 Filipino family drama film directed by Rory Quintos starring Vilma Santos and Claudine Barretto with Baron Geisler.The film was critically acclaimed by film critics. It was the Philippines' submission to the 73rd Academy Awards for the Academy Award for Best Foreign Language Film, but was not accepted as a nominee. Got 2 Believe is a 2002 Filipino romantic-comedy film starring Claudine Barretto and Rico Yan. The title originated from the popular song "Got to Believe in Magic" performed by David Pomeranz, and covered by Filipino band Side A, which was also the movie's theme song. It was a box office success in the Philippines. The movie was directed by Olivia Lamasan and produced by Star Cinema, the film production arm of ABS-CBN. This would be Rico Yan's last film before his death in March later that year. In 1992, Barretto was discovered by talent manager Douglas Quijano through older sister, Gretchen Barretto, also an actress. That same year, she landed her first major role on television when she was cast for ABS-CBN's youth-oriented variety show, Ang TV . Gretchen Barretto is a Filipina actress from the Philippines. She was launched in Regal Films' 14 Going on Steady as a singer-actress, with the release of her debut single "Going Steady", which served as the soundtrack single to her debut film. In the late eighties, Barretto rose to prominence after gaining success in skin flicks produced by Seiko Films like Tukso, Layuan Mo Ako!, Ang Bukas Ay Akin, Ama, Bakit Mo Ako Pinabayaan?, Lumayo Ka Man Sa Akin and Bakit Ako Mahihiya?. She has released two studio albums under Star Records. Her debut album, Unexpected, was released in 2008, and her second album Complicated was released a year after. Her two younger sisters, Marjorie and Claudine, and niece Julia are also actresses. Since 2010, she is already a contract star of ABS-CBN. In 1993, she starred at television series Home Along Da Riles with Dolphy which further introduced her to the media. She starred at the film adaptation of Home Along Da Riles and May Minamahal . That same year she also was cast as a minor character in two television series, Oki Doki Doc (1993-2000) and Palibhasa Lalake (1993-1998). 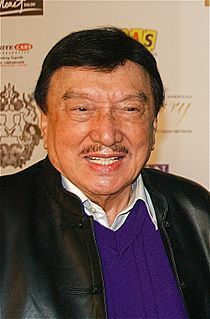 Rodolfo Vera Quizon Sr., known by his screen names Dolphy, Pidol, and Golay (1944), was a Filipino comedian-actor in the Philippines. He is widely regarded as the country's King of Comedy for his comedic talent embodied by his long roster of works on stage, radio, television and movies. May Minamahal was a 1993 Filipino film produced by Star Cinema and was turned into a TV series by ABS-CBN. Its rough translation in English is "Loving Someone". Oki Doki Doc is an ABS-CBN comedy sitcom which was shown from October 23, 1993 to December 2, 2000. It originally aired every Saturday nights, then transferred to Wednesday nights, and later transferred back to Saturday nights again. This show is referenced in the new ABS-CBN sitcom That's My Doc. In 1995, she starred in Pare Ko with Mark Anthony Fernandez. She also starred in the film adaptation of Oki Doki Doc: The Movie . She also became one of the host in ASAP that year. Mark Anthony L. Fernández is a Filipino actor. He is the son of Rudy Fernández and Alma Moreno. In 1996, she starred in various films with Star Cinema which includes, Radio Romance, her first film with Rico Yan, Mangarap Ka, her first major film role, with Mark Anthony Fernandez, and Madrasta with Sharon Cuneta and Christopher de Leon. In 1997, she starred in television drama series, Mula sa Puso . The series ran for three consecutive years on ABS-CBN. That same year she starred in the films Home Along Da Riles 2 with Dolphy, Calvento Files: The Movie with Rio Locsin and Diether Ocampo, and F.L.A.M.E.S.The Movie with Rico Yan, Paula Peralejo, and Boots Anson-Roa. In 1998, she portrayed Mela in the film Dahil Mahal na Mahal Kita , directed by Wenn V. Deramas, alongside Rico Yan and Diether Ocampo. Then came 1999's Saan Ka Man Naroroon where her performance as triplets Rosario, Rosenda and Rosemarie earned her a nomination for Best Actress in the Asian TV Awards. Also the same year she starred in the films Soltera with Diether Ocampo and Maricel Soriano, and Mula sa Puso The Movie . She has also worked in the film Anak , which was directed by Rory Quintos. In 2001, she was cast as the lead actor in the drama series Sa Dulo Ng Walang Hanggan (2001-2003) with Carlos Agassi, Luis Alandy, and Mylene Dizon. She also starred in the film Oops! Teka Lang... Diskarte Ko 'To with Robin Padilla that same year. In 2002, she starred in Olivia Lamasan's film Got 2 Believe with real-life partner Rico Yan. The film received critical and box office success some noting it as one of the best romantic movies of all time and has inspired countless films that followed it. Her real-life partner Rico Yan died in March of the same year. After a short break in work, Claudine had another box office hit film that same year in Rory Quintos' film Kailangan Kita with Aga Muhlach, her acting in this film was once again acclaimed by critics and many has cited it as one of her best works. In 2003, she took the lead in Wenn V. Deramas' television series Buttercup (2003-2004) with Assunta De Rossi, Piolo Pascual, and Diether Ocampo. In 2004, she starred in a fantasy television series Marina with Rafael Rosell and Cherie Gil which one her numerous awards. Also the same year she filmed Milan, directed by Olivia Lamasan, and co-starred with Piolo Pascual and Iza Calzado. The film received widespread critical acclaim for its original story and cinematography and has been noted as one of the best romance movies of Philippine Cinema. Her performance of the film also won her a FAMAS Award for Best Actress. In 2005, she portrayed Pilar in the film Nasaan Ka Man , directed by Cholo Laurel, with Jericho Rosales, Diether Ocampo, Gloria Diaz, and Hilda Koronel. The film won her another FAMAS Award for Best Actress and has also been cited as one of her best works. That same year she starred in the film Dubai , directed by Rory Quintos, with co-stars Aga Muhlach and John Lloyd Cruz. Also that same year she took on the lead role in the television drama series Ikaw ang Lahat sa Akin with Diether Ocampo, Angelika dela Cruz, Bea Alonzo, John Lloyd Cruz, and Shaina Magdayao. In 2006, she starred in the horror film, Sukob , directed by Chito S. Roño, with co-star Kris Aquino. The film was the highest-grossing film of 2006. In 2007, she took the lead in the television drama series Walang Kapalit, directed by Wenn V. Deramas, she starred with Piolo Pacual and Jodi Sta Maria. In 2008, she portrayed Angela Cortez in Sineserye Presents: Maligno , a fantasy television anthology, she co-starred with Kim Chiu, Diether Ocampo, and Rafael Rosell. Also that same year she portrayed Catherine De La Rhea in the television drama series Iisa Pa Lamang , directed by Ruel S. Bayani. She co-starred with Angelica Panganiban, Diether Ocampo, Gabby Concepcion, Cherry Pie Picache, and Susan Roces. The series became 2008's hottest television primetime drama and is regarded as one of Claudine's best televisions series. In 2009, she broke ties with her long-time network, ABS-CBN and transferred to GMA Network. In 2010, she started her own reality television series, Claudine with GMA Network. Also that same year she played the character Ciara delos Santos in the film In Your Eyes , directed by Mac Alejandre, she co-starred with Anne Curtis and Richard Gutierrez. The film was produced by GMA Films and Viva Films. The film did well in the box-office with its P62 million gross. In 2011, she played lead in the television drama Iglot . She co-starred with Jolina Magdangal and Marvin Agustin. In 2011-12, she was involved in a public battle with her sisters Gretchen Barretto and Marjorie Barretto and also an Airport Scandal with Ramon Tulfo. The year after that she filled for annulment with her husband, Raymart Santiago, stating that she was a "battered" as a wife. These highly controversial and publicized events lead Claudine to stop acting and focus on her personal life and her children. In 2015, she began working for her comeback. She first started by choosing a healthier lifestyle and mending her relationship with her family including niece Julia Barretto and sister Marjorie Barretto. Also that year she starred in the film Etiquette for Mistresses, directed by Chito S. Roño, with co-stars Kris Aquino, Kim Chiu, Iza Calzado, and Cheena Crab. The film was controversial but was acclaimed critically and was a box-office hit with P200 million. Claudine starred in Maalaala Mo Kaya in the episode "Itak/Bolo" which aired in October 24 of that year, marking her first appearance on the series in more than 20 years. Her performance was widely acclaimed by viewers. In 2016, she signed with TV5 Network and played Marla Alvarez in the drama series Bakit Manipis ang Ulap? . It was directed by Joel Lamangan and she starred with Diether Ocampo, Cesar Montano, and Meg Imperial. That same year she played the role of Lorena in Maalaala Mo Kaya's "Luneta Park" episode. The episode aired on December 24 and co-starred with Dominic Ochoa. In 2017, she attended the Star Magic Ball 2017, her first ever appearance on the ball since she left ABS-CBN network in 2009. In March 2006, she married actor Raymart Santiago, but were divorced in 2013. They have two children, Sabina and Santino Santiago and last 2015 Claudine Barretto adopted a child name Quia Barretto. In February 2019, The rift between her older sibling, Gretchen Barretto ended. After almost 6 years of silence, they have finally settled their differences. 2015 Etiquette for Mistresses Chloe Zamora Star Cinema Comeback with Star Cinema and reunion project with Kris Aquino after Sukob. Her last movie appearance. Got 2 Believe Antonia "Toni" Villacorta Last film with Rico Yan before his death. Released about a month before Yan's death. Reunited with Mula sa Puso co-star. 2000 Anak Carla Star Cinema Co-lead role with veteran actress Vilma Santos. 1999 Soltera Liza Reunited with Mula sa Puso co-star Diether Ocampo. Mula sa Puso: The Movie Olivia "Via" Pereira-Maglayon Film version based on the television drama series. 1997 F.L.A.M.E.S. : The Movie Karina Star Cinema Title: Pangako. With Mula sa Puso co-star Rico Yan. Calvento Files: The Movie Valerie Title: Balintuwad. With Mula sa Puso co-star Diether Ocampo. Home Along Da Riles Da Movie Bing Kosme Film based on situational comedy series. Barretto reprised her role as Bing Kosme. As a film actress, she has received two FAMAS Award for Best Actress for films Milan (2004) and Nasaan Ka Man (2005) and a Luna Award for Best Actress for the film Milan. In 2009, she was recognised as one of Cinema One's 15 Legends, where she was recognised together with 14 other iconic film stars of the Philippines who helped define Philippine Cinema. These 14 stars were Fernando Poe Jr., Dolphy, Nora Aunor, Susan Roces, Nida Blanca, Christopher de Leon, Vilma Santos, Maricel Soriano, Aga Muhlach, Robin Padilla, Judy Ann Santos, John Lloyd Cruz, Sharon Cuneta, and Piolo Pascual. In 2010, Yes! Magazine ranked her as the 6th person Who Ruled the Decade (2000-2009). In 2011, Yes! Magazine ranked her as the 11th Most Beautiful Star. In 2016, she won Dangal ng PASADO sa Pangkatang Pagganap ng may Mataas na Papuri in the 18th Gawad PASADO Awards for her film Etiquette for Mistresses (2015). 2006 "The Gift"  Star Records BMG Music Publishing, Ltd. and Sony Music Entertainment (Philippines), Inc.
Angelica Locsin Colmenares is a Filipina television and film actress, commercial model, film producer and fashion designer. She came to prominence for her television roles as Alwina in the 2004 fantasy-themed television series Mulawin and as the superheroine Darna in the TV adaptation of the Mars Ravelo eponymous comic. Locsin was a contract artist of GMA Network up to early 2007 until she transferred to its rival network, ABS-CBN. She then starred as Lyka in the television series Lobo, which earned her an International Emmy Award nomination for best performance. She later on starred in blockbuster films In The Name Of Love and One More Try for which she garnered critical acclaim for both performances. The two films earned Locsin the Star Award for Movies for Movie Actress of the Year and the Box-Office Entertainment Award for Film Actress of the Year, winning both awards two consecutive years. In 2013, she won the FAMAS Award and the Film Academy of the Philippines Award for best actress for her performance in One More Try. Mula sa Puso is a Filipino primetime melodrama romance television series originally aired by ABS-CBN from March 10, 1997 to April 9, 1999. Claudine Barretto, Rico Yan, and Diether Ocampo played the roles of the main protagonists in the series. It was re-aired in 2008 through Studio 23 and Kapamilya Channel, which are both ABS-CBN subsidiaries. A 2011 remake, starring Lauren Young, JM De Guzman and Enrique Gil, aired on ABS-CBN from March 28, 2011 to August 12, 2011. Maria Izadora Ussher Calzado is a Filipino actress, television host, dancer, and model who previously worked as one of GMA Network's homegrown contract artists. After ten years, Calzado signed an exclusive contract with ABS-CBN. Calzado also signed a non-exclusive contract with Star Cinema. By 2014, she also became one of the main celebrity ambassadors of Booky, top local food app and blog of which her husband, Ben Wintle, is the CEO. Last March 2017, she won the Yakushi Pearl Award for Best Performance in the Osaka Film Festival for her performance in the film Bliss. Maja Ross Andres Salvador is a Filipina actress, dancer, singer, model, occasional host and producer. She is currently under the management of ABS-CBN's Star Magic and is regarded as the "Dance Princess". In 2011, Salvador co-produced and portrayed the title role in the film Thelma, which earned her the Gawad Urian Award and the Film Academy of the Philippines Award for Best Actress. She is widely known for her roles in the TV series Nagsimula sa Puso, Minsan Lang kita Iibigin, Ina Kapatid Anak, The Legal Wife and Bridges of Love. In 2017, Salvador rose to prominence for her role as Lily Cruz / Ivy Aguas in Wildflower. Angelica Charlson, professionally known as Angelica Panganiban, is a Filipino film and television actress and comedian. Philippine television drama, also known as teleserye, Filipino telenovelas or P-drama, is a form of melodramatic serialized fiction in television in the Philippines. Teleserye is derived from two Filipino words: "tele", which is short for "telebisyón" (television) and "sérye" (series). Melissa Marie Ricks is a Filipino-American actress. She was a runner-up in the reality talent search Star Circle Quest on ABS-CBN. Lauren Anne Talde Young, simply known as Lauren Young, is a Filipino-American actress and model. She is the younger sister of actress and Miss World 2013 Megan Young. In 2012, she transferred to GMA Network and changed her manager; she chose Pia Magalona, the wife of the late Francis Magalona. Mylene Lilibeth Dizon is a Filipino actress and model. She was a member of ABS-CBN's Star Magic, being an alumna of Batch 2. After starting with ABS-CBN in 1996, she transferred to the rival station GMA Network in 2003 and was part of several TV series like Captain Barbell, Agawin Mo Man Ang Lahat, and Dyesebel. Upon returning to ABS-CBN in 2009, she made a special appearance on Tayong Dalawa. Her role ended when she became pregnant with her second child, and was then replaced by Jodi Sta. Maria. Soltera is a 1999 Filipino film produced by Star Cinema, starring Claudine Barretto, Diether Ocampo and Ms. Maricel Soriano. The film was directed by Jerry Lopez Sineneng. Barretto and Ocampo reunited since Mula sa Puso. Mula sa Puso is a Philippine remake of the original 1997 TV series that starred Claudine Barretto, Rico Yan and Diether Ocampo airing on ABS-CBN from March 10, 1997 to April 9, 1999. The 2011 remake stars Lauren Young, JM De Guzman and Enrique Gil. The show is directed by the same director of the original series, Wenn V. Deramas. This is the second soap opera remake of the network after its initial success and high ratings of the 2010 remake, Mara Clara. The show's original airing was at 6:00pm in 1997-1999 and was used again broadcasting this 2011. Candy Pangilinan is a Filipino film and television actress and comedian. She won best actress for CineFilipino 2016 and Los Angeles International Film Festival for the movie Star na si Van Damme. 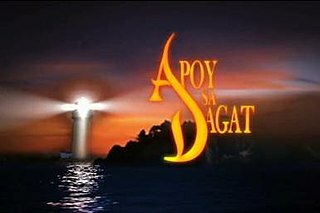 Apoy Sa Dagat is a 2013 Philippine melodrama romantic suspense television series directed by FM Reyes and Nick Olanka, starring Angelica Panganiban in her first dual role, together with Piolo Pascual and Diether Ocampo. The series was aired on ABS-CBN's Primetime Bida evening block from February 11, 2013 to July 5, 2013, replacing Kahit Puso'y Masugatan, and was replaced by Muling Buksan ang Puso on its timeslot. Bernadette Vela Punzalan, known professionally as Princess Punzalan, is a Filipino actress. She began her career starring in Lovingly Yours: The Movie (1984) and Lovingly Yours, Helen (1992-96) and was nominated of PMPC Star Awards for Television in 1987. Her profile continued to grow when she starred as antagonist Selina Pereira-Matias in Mula sa Puso (1997–99) with Claudine Barretto, and won Best Actress in 1998. Sue Ramirez is a Filipina actress and singer. Her first major role was as supporting cast member on the ABS-CBN remake of Mula Sa Puso of the same name (2011). She appeared in the television dramas Angelito: Batang Ama (2011–12), Angelito: Ang Bagong Yugto (2012), Annaliza (2013–2014), Pangako Sa 'Yo (2015), Dolce Amore (2016), La Luna Sangre (2017), Hanggang Saan (2017–18) and Ang Probinsyano (2018). She gained her New Movie Actress Nomination in the 32nd PMPC Star Awards for Movies for the film Just the Way You Are. Bakit Manipis ang Ulap? was a Philippine drama series broadcast by TV5 starring Claudine Barretto, Diether Ocampo, Cesar Montano and Meg Imperial. Barretto and Ocampo reunited from Star Cinema's Calvento Files: The Movie, Dahil Mahal na Mahal Kita and Soltera, and ABS-CBN's telenovela Mula sa Puso, Saan Ka Man Naroroon, Ikaw ang Lahat sa Akin, and Iisa Pa Lamang. It is based on the 1985 film of the same title created by Danny Zialcita. It premiered on February 15, 2016. However, due to low ratings and negative comments about the show, the management of TV5 decided to cancel the show, and aired its final episode on April 22 after almost two months of airing. Julia Montes is a Filipino actress of German descent who made her acting debut on television in 2001 in the drama series Sana Ay Ikaw Na Nga. The following years she made her first appearance in the soap opera Hiram (2004) and went on to appear in the television kids gag show Goin' Bulilit as a series regular until her departure in 2008. She also made guest appearances in several television series in the 2000s such as Ligaw na Bulaklak (2008), I Love Betty La Fea (2008), Nasaan Ka Maruja? (2009), Katorse (2010), and The Substitute Bride (2010). Among Montes' releases of 2007 were the dramas Paano Kita Iibigin and Bahay Kubo: A Pinoy Mano Po! with supporting roles. In 2008, she made a brief appearance as Anna in Chito S. Roño's drama Caregiver. A year later, she had a cameo appearance in the supernatural horror T2 and another supporting role in the horror film, Dalaw (2010). ↑ "23rd Star Awards for Television nominees bared - PEP.ph: The Number One Site for Philippine Showbiz". Pep.ph. 26 October 2009. Retrieved 2015-10-27. ↑ "Milan (2004)". IMDb. 11 February 2004. 1 2 "Cinema One Originals 2009 winners bared - PEP.ph: The Number One Site for Philippine Showbiz". Pep.ph. 18 November 2009. Retrieved 2015-10-27. ↑ "The YES! List ranks the top 20 stars who ruled the decade (2000-2009); (digital version is now available) - PEP.ph: The Number One Site for Philippine Showbiz". Pep.ph. 17 April 2010. Retrieved 2015-10-27.